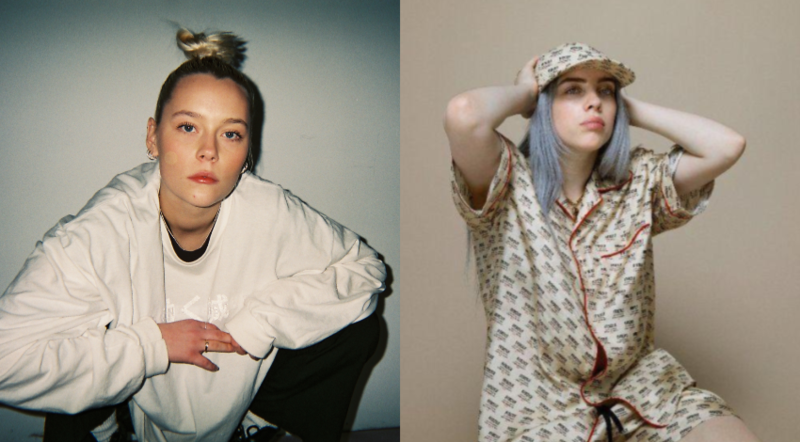 Billie Eilish is 17 and bigger than life. It’s funny how her age is enduringly the first detail journalists note as if anyone reading hasn’t already had the industry’s festishization of youth drilled into their heads. Last Friday, Billie’s video release for “you should see me in a crown” in collaboration with Takashi Murakami dropped- a moment of extreme cultural significance. Today Billie’s album dropped and charted immediately; every track on the album will continue to climb up and down the chart crossing over one another like a slew of rock climbers sharing a wall and refusing to hit the floor. Vera Hotsauce released a single today which is arguably better than some of the tracks on Billie’s project- . I’d like to think that in her hometown of Stockholm, people are actively listening to Vera’s music in place of Billie’s. I am under the impression that Vera and Billie would likely be friends- they dress well, seem confident in themselves while remaining humble, and their music packs an emotional right-left hook combo. In 2007, Murakami created the cover artwork for Kanye West’s album, “Graduation,” and directed an animated music video for West’s song “Good Morning.” I’ve always believed one of two notions to be true- anything Takashi touches turns to gold or Takashi only touches that which is already gold. My sister, who works in the Berlin art scene, recently traveled to Shanghai for an art week of sorts where she met Takashi at a party. I was overcome with jealousy when I scrolled upon her blurry photo on Instagram in which she rocked Kanye stunner shades for likely the first time since we both acquired pairs at Kanye’s 2008 “Glow In The Dark Tour.” Pictured is Takashi’s arm around her shoulder. I laugh, thinking this moment is the pinnacle of her career if that what he touches is subject to alchemy. Vera looks very much like Chloe Grace Moretz if Chloe were noticeably tattooed and fond of rocking a grill in press shots despite them masking her near perfect smile. While Vera spent time in Los Angeles writing with Elliphant and Diplo prior to releasing her first single, Spotify’s overly detailed statistics point to the fact that she only has 115 monthly listeners in the City of Angels. I’d like to think that a large percentage of those supporters have come from me pleading her case to whoever will listen. Billie boasts 586,011 listeners in Los Angeles, as in roughly 7% of the city’s population. Known as Vera Carlbom by those close to her, the swagger that the Swedish up-and-comer flaunts is similar to that of Billie’s. She is 18, one year older than Billie. The luminous energy that transcends Vera’s and Billie’s content both on socials and in your headphones takes form as a feeling not often felt- I attribute it to their seemingly unadulterated youth. There is no sense of either artist being jaded or fake in Vera’s Daddy or Billie’s Six Feet Under. When you are in your teens, emotions are often felt with an intensive clarity and in the case of these two tracks, it shows. In 2017 Billie asserts, “I don’t care if you think I look bad or you don’t like me. You’re still thinking about me, and I’m going around in your head. A lot of people are just so afraid of what other people think, which is just so stupid” (a beautiful perspective). I believe Billie and have always believed in her for some reason- even when blogs pump out conspiracy theories, my friends decide her to be too much of a scene and her fan base grows increasingly pop-centric. Vera asserts: “Watch Me! I’m going to take over. I’m going to be the best and the greatest.” I believe her and simultaneously believe in her. If Takashi were to take a liking to Vera’s music, he could readily skyrocket her career to levels beyond belief but she’d remain miles from where Billie has found herself. To reassess my previous thought- perhaps anything Takashi touches does, in fact, turn to gold but he chooses to only touch that which is already gold so as not to play God and exist within the existing energy of the entertainment universe. Daddy is Vera’s strongest track in my opinion. The song, off her 4-track EP “Let Me Show U What Love Is”, is a heartbreaking account of the 6 years she spent without the proper support of a father. Upon first listen, the depth to the track went in one ear and out the other- ignorantly mistaking daddy for some urban innuendo rather than taking it literally as one should. Rather than channeling anger towards him, Vera’s use of “Daddy” is quite literally a term of endearment that is paired with a certain sympathy and longing for him. The repetition of “I miss you”, X amount of times to be exact, exemplifies the aforementioned teenage emotion which also exists in Billie’s early work- the catharsis experienced in a mindful listening is jarring. Kanye is not the artist or human he was when he collaborated with Takashi on Graduation. His last handful of releases and publicity stunts were blown up by the media to an extent surpassing their deserved attention- I cringe at the mention of “whoopity scoop.” Simultaneously, certain moments and pieces of content that exist within these simultaneously over-publicized and overlooked releases will never gain the acclaim or hold the social influence that they should have. If it were released prior to the streaming era, “Reborn” would have been the song of our generation (ironically, KIDS SEE GHOST was also creatively directed by Takashi). Vera Hotsauce has not released a full-length album yet but her release today points to improvement and her signing to Ten Music Group is exciting as she shares a team with legends such as Icona Pop and strong newcomers such as Zara Larsson. In the iconic Vanity Fair piece- Billie Eilish: Same Interview, One Year Apart- you can quite literally see what time can do to a human when fame is in the picture. Fame is a wild beast which most would admittedly like to ride but few come out unscathed. 7 minutes into the video, the “one year later” Billie responds to the simple question, “Is it worth it?” Billie’s mouth gapes and morphs for what seems like an eternity before she turns her head and hesitantly says, “Yes… you have to remember [the shows and supporters] when it doesn’t feel worth it because a lot of it doesn’t feel worth it but then you get to the points that do make it worth it and then it all sort of makes sense.” This response says so much while saying so little. This interview has been streamed well over 28 million times since the day I first wrote on it and sympathized with Billie.